Older and LGBTQ? You’re welcome here. Many older LGBTQ (lesbian, gay, bisexual, transgender, queer) people find themselves having to go ‘back in the closet’ when they enter supported living arrangements like nursing homes, but one group of care homes in Brighton and Hove are making sure that this isn’t the care for their residents. 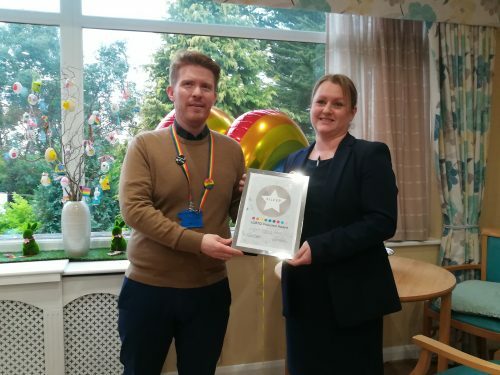 Brighton-based LGBTQ charity Switchboard’s pioneering new LGBTQ Inclusion Award celebrates the first Nursing Home Group’s achievement of a Silver Award, joining the growing number of health and care settings across Sussex who have achieved an award for being welcoming to LGBTQ people. Victoria Nursing Group are the first organisation of their kind of commit to making their service LGBTQ inclusive through a combination of training and making changes to their care homes, policies, and practices. They have just been awarded a prestigious Silver Award by Switchboard for LGBTQ inclusion. 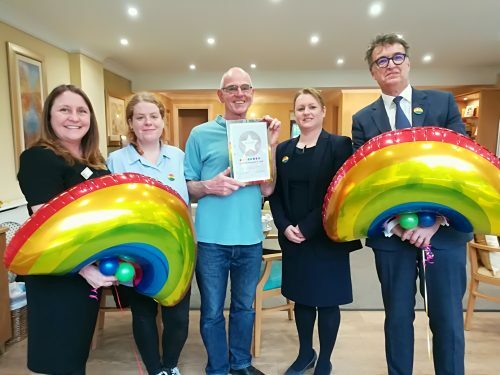 This award means that their residents, regardless of their sexual orientation or gender identity, will have a positive experience of their care and they will remain connected with the wider community in the city. There are an estimated one million LGBT people over the age of 55 in the UK. Evidence still suggests that older LGBTQ people feel unable to be open about their identities in health and social care settings. Working closely with Switchboard, Victoria Nursing Group has confronted this issue in all three of its Hove-based homes by training over 75% of staff in LGBTQ Awareness and Inclusion, as well as introducing tools like pronoun badges and building links with LGBTQ services and support groups in the city. LGBTQ residents will now see their identities reflected in things like reading materials and posters, as well as being able to talk to staff about their experiences and their needs. For the last 44 years Switchboard has been providing information and support to lesbian, gay, bisexual, transgender and queer (LGBTQ) people. Set up initially as a helpline the charity now provides a number of specialist LGBTQ services, including and health and inclusion project that engages with LGBTQ people on a range of topics related to health and wellbeing.